They’re the stuff of nightmares, and they’re crafted out of every child’s favorite disposable plaything. Meet the creations of the brilliantly mad sculptor Jason Hackenwerth. 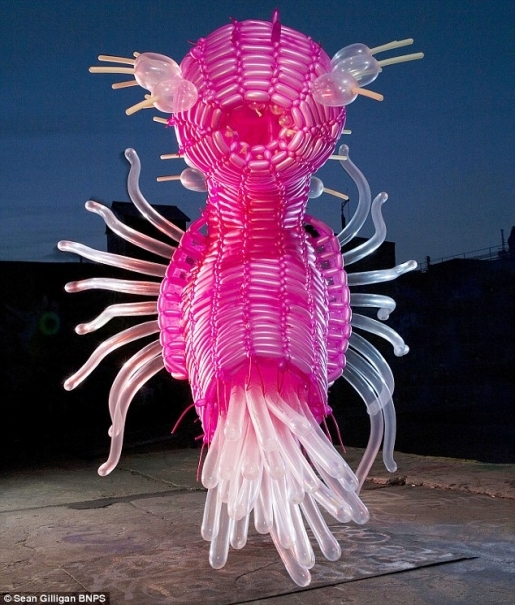 He crafts fierce monsters, some over 40 feet long, out of nothing but pure balloons. That’s right, brightly-colored, inflated, rubber tubes and spheres, thousands of them, are the key to Jason’s ethereal work. Check out more about the method behind the madness of the New York artist. Jason is going to have an installation at Grand Rapids, Michigan’s Urban Institute for Contemporary Arts until October 10, if you’re interested in checking out his balloon nightmares up close and personal. If you can’t make it to the UICA, you can watch Jason at work. The eight-hour process of how he makes his monsters is fascinating! tuesday : 09 15 09 : building a megamite from romy owens on Vimeo. There have been people who have used party balloons for travel, but to take a tradition like the balloon animal and turn it into something like a giant balloon monster is pretty inventive, don’t you think? Just thinking about inflating all those balloons makes me short of breath!